How do I buy The Brothers That Just Do Gutters Franchise? The Brothers That Just Do Gutters is a community minded, client-focused gutter contractor that installs, repairs and cleans gutters. 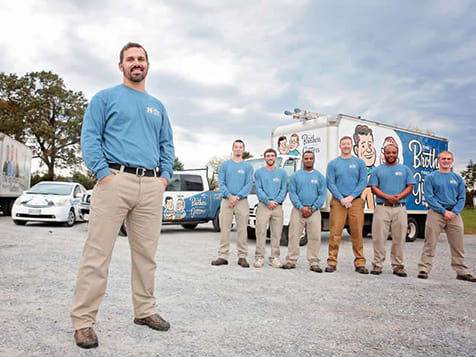 To buy The Brothers That Just Do Gutters franchise requires a territory fee of $40,000, a liquid capital amount of $100,000 and a total investment between $108,000-$170,000. The Brothers That Just Do Gutters provides manuals, training resources, as well as a call center, ongoing support and marketing. Open The Brothers That Just Do Gutters in any of these available states: AK, AL, AR, AZ, CA, CO, CT, DC, DE, FL, GA, IA, ID, IL, IN, KS, KY, LA, MA, MD, ME, MI, MN, MO, MS, MT, NC, ND, NE, NH, NJ, NM, NV, NY, OH, OK, OR, PA, RI, SC, SD, TN, TX, UT, VA, VT, WA, WI, WV, WY. The Brothers That Just Do Gutters is not currently active in our directory, but here are some other recommended selections for you to explore.